When it comes to early Christianity in the North-East – and Hexham in particular – most casual history enthusiasts look no further than the likes of Cuthbert, Aidan and Bede. The hard-nosed, super-industrious Wilfrid also comes into the frame, too, of course, being the chap who founded Hexham Abbey and a great many other religious houses in the late 7th century AD. But every great man needs his lieutenants, and Wilfrid’s was a man by the name of Acca. Acca was born in the ancient kingdom of Northumbria around 660, and initially seems to have served in the household of Bosa, the future Bishop of York; but he soon found himself under Wilfrid, probably by the time he was 20. From the late 670s through to Wilfrid’s death in 709, Acca accompanied the great man on his continental travels and served as first his protégé, then his fully-fledged right-hand man during his many high-ranking incumbencies. In 692 Acca was appointed abbot of St.Andrew’s monastery, part of the Hexham Abbey/Priory set-up. Then in the later years of Wilfrid’s life he acted as the old man’s loyal and closest companion, eventually being named by Wilfrid himself as his successor as Bishop of Hexham in 709. Acca threw himself into the running of the diocese with gusto, and completed the construction work begun by his mentor. He was a great theologian and rather keen on music, too, once bringing the great cantor, Maban, north for a visit. He was a great friend of Bede, who dedicated many of his works to him – such was his reputation as a cleric and all-round good egg. In short, he brought to completion all of Wilfrid’s Christian plans for both Hexham (including improving and ornamenting the church) and Northumbria (founding many churches, among other things), thus helping cement his predecessor’s legacy. Acca presided as bishop for 23 years until, in 732, during a period of dynastic upheaval, he was forced to leave. It is not known for sure why he was obliged to flee, but it may have been due to his familial links with the exiting ruling family. Sources vary as to his destination – some say Whithorn or St.Andrew’s in Scotland, others say Ireland – but he eventually returned to Hexham when circumstances permitted, where he was warmly and reverently received. He died in the town at some point during 737-42, was interred near the abbey’s east wall and, in time, was raised to the sainthood. A remnant of one of the two crosses which marked his grave can be found inside the abbey today. When we think in terms of historical relics, especially religious ones, we often look towards the big, the beautiful, the imposing or the imperial. Seldom do we thing of a slightly lop-sided lump of misshapen rock as anything more than quarry fodder. But not so Hexham’s enigmatic Frith Stool. Unimpressive it may be, but the tiny throne that sits in the middle of the Choir of the town’s mighty abbey has captured the imaginations of visitors for generations. It is made of sandstone and is also known as St.Wilfrid’s Throne (after the 7th century founder of the abbey) and the ‘Chair of Peace’ (frith meaning ‘peace’, as in being a place of sanctuary). So, yes, this was the spot where, during the Middle Ages, wrongdoers made for as their little area of sanctuary when in flight from authority. It is generally thought that originally the Frith Stool was made and used by Bishop Wilfrid himself, based, as it was, on similar items of furniture he had seen in cathedrals on his continental tours. 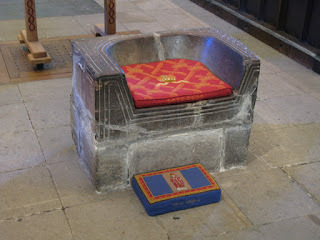 It was, quite literally, a throne from which he and succeeding bishops would preside during religious ceremonies. Remember, Hexham Abbey was a cathedral from 678 to around 821, which would have made the Frith Stool an official cathedra and an item of supreme importance. It’s likely the stool originally stood on legs and was set against a wall; but since its construction the original building in which it was housed has long since gone. The present-day Hexham Abbey is a Norman creation, but it is interesting that the stool has survived many centuries of upheaval – it was clearly a treasured relic. In more recent centuries, though, the stool has been moved here and there around the abbey with a little less respect. It was during one of these moves that someone seems to have dropped it and it broke into several pieces. It was rather clumsily patched up, until, eventually, it rose once again to reverential status and was placed in its current location in 1910.